The environment in which we work is transforming rapidly. In the next decade, change will be a constant companion. With an ageing demographic and changing community expectations, services will need to adapt and prepare to meet new challenges. Managers and coordinators need to be proactive learners, whether it be in regards to new programs or changing client demands. Organisations will need to understand what change will mean for them and make plans accordingly. They need to take initiative and be innovative. 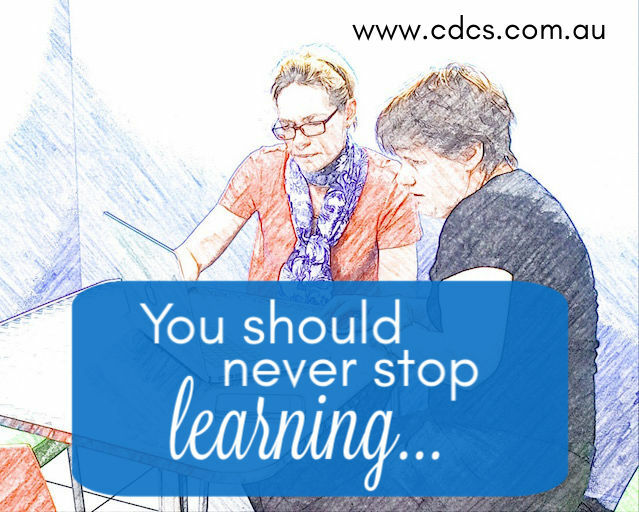 People often go to university or TAFE to gain a qualification in their chosen career, however learning should never stop just because we’ve completed a course of study. Formal training provides us with a base to which we can apply learning, but many concepts require application to fully understand them in context. This is why when people first learn about particular theories in their field of study they may find them difficult to grasp. Once out in the workforce however, application of the theories or concepts helps the learner to become familiar with and understand them better. Of course, knowledge is continually evolving and we regularly gain new insights through scientific research. For this reason, we should always be actively seeking new information or deepening that which we have. Also, you’ve probably noticed position statements of Government agencies changing in response to public demand, or from lobby groups, and as an organisation you may need to adapt your own policies to align your business to these changes. We’ve found that most people tend to wait until they are forced to make a change. They have so many other competing demands on their time that keeping up with changes on the horizon becomes a lower priority. There will be a payoff to this, we promise. By focussing on keeping up-to-date, learning new things and looking after yourself, both you and your organisation will benefit. You’ll feel better and have more energy to do your job better. Of course, this isn’t just about you. Your organisation or business will also benefit from your Personal Development Plan. Fewer sick days and improved staff retention are also positive outcomes when an organisation is well run. What could you include in your Personal Development Plan? We suggest that you consider what skills or knowledge you want to learn that would enhance your role and give you a sense of satisfaction. What actions do you need to take to support yourself in this? Perhaps you want to stay up to date with what is happening in the aged care industry. You could subscribe to industry newsletters and magazines and take the opportunity to browse these on a weekly basis. As well as the Department of Health’s newsletters, which you can find on their website and subscribe to, there are a number of other options out there. News and magazine articles often contain an industry professional’s viewpoint, or description of how another organisation has applied an aged care concept such as consumer directed care. An example of a popular industry magazine here in Australia is the Australian Ageing Agenda and their sister magazine the Community Care Review. You could also subscribe to industry related or special interest websites. For example, here on the CDCS website, we write regular articles that focus on community aged care, often with a rural and remote perspective. We do this to help organisations understand key aged care concepts and reforms as it relates to that context. Perhaps you want to learn more about a particular aspect of aged care support. Maybe you are interested in learning more about nutrition and how to support clients with a specific health condition that has special dietary requirements. You could enrol in an online course through one of the Universities to gain this information (a great idea if you have the time to commit to formal study and gain a qualification). A low cost option to this would be identifying specialty organisations that provide aged care specific training such as Nutrition Australia or employ a nutritionist to work within your organisation to provide nutrition assessments and training for your clients and staff. If you get involved with the process you’ll gain an applied knowledge of nutrition in aged care. Do you need to develop skills in key areas to improve outcomes? For example, last year a number of participants in our Managers MasterMind group wanted to improve their skills in grant writing. We were able to bring in a specialist grant writer (via video link) who provided many great tips and ideas, designed to improve the outcome of grant applications. If you have a specific skill you want to learn, you could find a specialist in that area of expertise and arrange one-on-one mentoring. Alternatively, if that is out of your budget, there are several cost-effective online courses you could enrol in. You could even head over to YouTube – with the thousands of videos uploaded every day, you’re sure to find something on the topic you want help with. Does your network need some maintenance? It’s true, ‘no man is an island’ and we often get the best outcomes through collaboration with others. In rural and remote aged care it is easy to become isolated and then overwhelmed in our own ‘world’. If you have a network of peers and support personnel who understand your operational context, it can make things easier for you, or at least let you feel less isolated. If this is an area you want to improve this year, try reaching out to others who are in a similar position to yourself. We’ve found that peers are usually more than happy to help work through an issue, sharing their experiences and knowledge freely. You might also want to factor in attendance at some industry events where you can meet up with like-minded people. Don’t overlook LinkedIn. What does your professional profile look like? LinkedIn has a large number of groups you can join, at no cost, where you can rub shoulders ‘virtually’ with influencers and leaders in aged care, and other industries, as well as reading some well thought out articles. In amongst all this work-related activity, don’t forget to include some ‘you’ time and opportunities. At the start of last year, I realised I had stacked on a few (15) extra kilograms and was feeling burnt out. I made it a priority to research what I could do to change that and then apply that knowledge. This has lead me to change my diet and encouraged me to get moving, and the payoff has been well worth it. I’ve been able to fit back into clothes I considered donating to the Op Shop, I have more energy and haven’t come down with any major illnesses this past year, despite the busy work schedule. I encourage you to think about what you need to do for yourself this year. Is it looking at what you are eating and making some changes? What rest periods/holidays have you planned this year? What is your physical activity level like? Do you need to improve this? What hobbies are you pursuing this year – are they new or is there something you want to pick up again? What books are you planning on reading this year, for pleasure or professional development? We challenge you to take some time and really think about what you want to achieve this year. Where do you want to go both professionally and personally and what actions do you need to take to get there? If you found this article interesting, please share it with others in your network who may also gain something from reading it. Why not take the opportunity to sign up to our email alerts as part of your new Personal Development Plan? We provide a round up of the month’s posts and other significant industry related news. It’s a great summary and easy read! You will also receive a little email whenever there’s a new blog post ready to read. Carrie is a passionate advocate for the provision of quality, community based, aged care. In her spare time, while she ages gracefully, she helps out with kids theatre, rides an electric bike and drags her husband off to explore the world as often as possible. Struggling to keep up-to-date with all the latest aged care news? Why not join our email list – it’s free and we send an email once a month with the highlights as well as a short email alert whenever there is a new post available.